I still remember the day I set eyes on Manny Pacquiao for the first time. It was 2001 and I was living in LA and a regular at the Wildcard Boxing Club in Hollywood, where I trained to stay in shape. Though not quite the Mecca of boxing it was destined to become, the place was special even then, attracting a heady mix of up and coming pros, the odd genuine contender and former champs. You also found a liberal sprinkling of Hollywood types and a cornucopia of characters from every walk of life that had to be experienced to be believed. It was just another afternoon and I was working on one of the double end bags, situated adjacent to the ring, when all of a sudden a shrill voice started screaming and grunting, so loud it echoed through the entire gym, forcing you to stop to look. In the ring was this painfully skinny kid shadowboxing. He had a red bandana tied round his head and was throwing punches and combinations at an imaginary opponent like his life depended on it – and with ferocious hand speed such as you’d never seen. But yet even so, after a watching him for a while I went back to my workout deciding he just another the many young pros from south of the border who came an went, arriving at Wildcard heads filled with dreams and hearts bursting with hope but ultimately destined to return home with nothing much more than bruises and memories to show for their shot at the big time. Yet as the weeks passed it became obvious that this Filipino kid was extraordinarily special. The speed was outlandish, yes, but it was the intensity he exuded that made him stand out. Whether on the mitts, whether shadowboxing, working the heavy bag, or in sparring, he positively burned, exploding combinations while moving in and out like a human ball of fast twitch fibres on speed. In those days he had nothing like the entourage he would acquire along with the superstardom he achieved. He was just another young pro learning his craft. I remember, on occasion, being part of the group of Wildcard regulars that went on early morning runs up and around the Griffith Park with Manny. No one could keep up with him, not even the pros who were around the same weight, but those early morning roadwork sessions were a joy to be a part of regardless. The point I’m trying to emphasize here is just how far Manny Pacquaio travelled from the streets (literally) of General Santos City in the Philippines to the start of his relationship with Freddie Roach at Wildcard as an unassuming and hungry young kid seeking to escape the poverty whence he came, and from there on to global superstardom, feted as the nearest thing to a living god at home in the Philippines and not far off it everywhere else. In his prime he took on the character of a machine, combining frightening, fearsome power with relentless aggression. 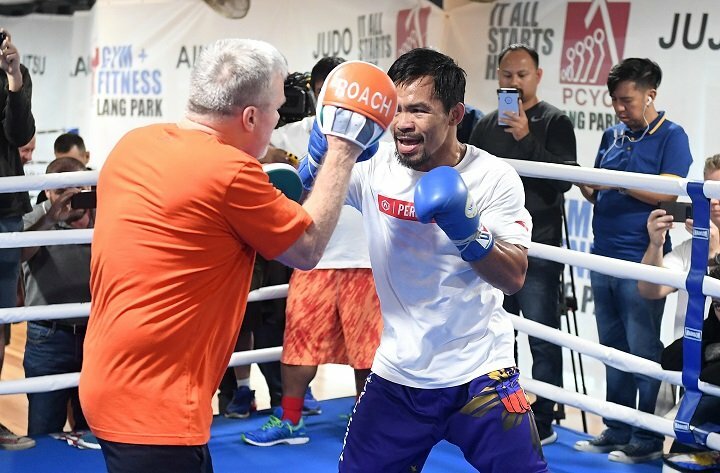 His partnership with Roach saw them each reach the heights of their respective trades, with Pacquiao recording some immense performances that will still be held up as examples of excellence in years to come. The golden period of his career arguably unfolded over a three year period between 2006 and 2009, when he was the closet thing to invincible and indestructible a fighter can be, rolling over the likes of Erik Morales, Jorge Solis, Marco Antonio Barrera, David Diaz, Oscar De La Hoya, Ricky Hatton and Miguel Cotto. The only ever eight-division world champion, winning 10 world titles, the Filipino at one time seemed to be sprinkled with stardust, he was so popular. His reign as one of the greats of his era was brought to a shuddering end at the hands of Juan Manuel Marquez, his ring nemesis, in the sixth round of their fourth meeting on December 8 2012. The Filipino southpaw walked into the kind of right ring hand that ends careers, in some cases even lives, in an instant, it was that brutal. The sight of him lying inert on the canvas afterwards remains one of the most anguishing sights I have ever seen at the end of a fight. Marquez is the one fighter who had Pacquiao’s number and arguably should have won three of their four fights. Instead he lost two, drew one and won the last. They fought 42 rounds in total, which count among the most competitive ever fought in the sport. Of his 68 fights the most anticipated was his 2015 clash with Mayweather. Everyone knows it should have happened six years before it did, when they were both at their peaks. However the ocean of bad blood between Mayweather and his old promoter, Bob Arum, who’s guided Pacquiao’s career from when he set foot in the States and to whom the Filipino has always remained loyal, ensured that it never did. The result was a gap in their respective careers that when finally filled proved a crushing anti-climax, involving a way below par Pacquiao failing to force his opponent out of second gear. That being said, Pacquiao’s career possessed more meaning for more people in a way Mayweather’s never came close to. The Filipino possessed a title far of far more value than any which the sport’s various sanctioning bodies could offer; he was the champion of society’s have nots at home in the Philippines, but also in his second home, the United States. There he was a symbol of pride for the legion of migrants who spend their lives serving and pandering to the rich – the cleaners, valets, busboys and day labourers, those who work in the swanky hotels, casinos and restaurants for a pittance. Every time he stepped into the ring Manny took with him their hopes and dreams, allowing them to enjoy the vicarious thrill of watching a champion who was of them and like them being exalted and respected in a culture in which their existence is barely acknowledged much less respected. The Filipino champion was for them a symbol of pride in a world of injustice, and in this regard his greatness is unsurpassed in our time. His foray into Filipino politics began with his election to the country’s House of Representatives in 2010 then again in 2013, subsequently running for and being elected to the Senate in 2016. But in trying to mix his career in politics with boxing he only lent truth to the biblical injunction, ‘No man can serve two masters’. His failure to stop any opponent in the ring since Miguel Cotto in 2009 tells its own story, evidence of a fighter whose killer instinct, snap, whatever you want to call it, deserted him along with the aura of destructiveness and invincibility he once carried into a squared circle in which there is no hiding place from a fighter’s hardest opponent – himself. Jeff Horn, no disrespect, would not have lasted three rounds against an in-prime – against even a just-post-prime – Manny Pacquiao. The Filipino’s controversial loss to the Australian only confirmed what most of us already knew. Whatever he had it is gone and isn’t coming back.